“Is it good?” ask my mom and my co-worker and my husband when I tell them I’m headed back to the old SoulFire barbecue spot in Allston. It’s not the first time I’ve eaten at bb.q CHICKEN, which opened last month, but it’s hard to say what exactly brings me back. There are problems, like sometimes the restaurant has an unpleasant musty smell, and many items on the enormous menu — literally, it is about 3 feet tall — aren’t actually available. And there are oddities, like the improperly mounted TVs with their wiring exposed, broadcasting poker tournaments, and blue vinyl booths that aren’t affixed to the floor so they scoot around. The aesthetic is based around fluorescent lighting and plastic Bertolli bottles, the contents of which will eventually be used to fry up the restaurant’s signature Golden Olive Chicken. Some things seem to have been lost in translation, but every time a friendly server brings you a perfectly cooked basket of fried chicken, you’re reminded you didn’t come here for the decor. You came for the compelling crunch and juiciness of KFC: Korean fried chicken. The place is filled with Korean-born students for a reason. This is not the place to take your juicing yoga buddy, or your office mate on a Paleo kick. It’s a place to take your 15-year-old son post soccer practice, or your roommate who has already had a couple of beers — the more likely scenario in this part of town. If you are familiar with BonChon, another popular Korean chain, bb.q CHICKEN is a different animal. BonChon is all about thin-crust, no-grease, bone-in wings. At bb.q you can find that crackly coating on the Gangnam-style wings (medium $11.95, large $22.95), which are flecked with black pepper, leeks, and garlic. The shatteringly crisp crust and salty bite certainly earn them a spot at the table, but manager John Park recommends the Secret Sweet Sauced Chicken. We try an order of Half & Half — 10 boneless tenders, half cloaked in the sticky-sweet barbecue sauce, half classic Golden Olive Chicken (this unadorned flavor shines brightest on bone-in pieces, $11.95 for 5 pieces, $22.95 for 10). As a dining companion points out, the brick-red lacquer has a distinct apple-sauce aftertaste, which, strangely, keeps us coming back for more. Of course, we can’t confirm what is in the secret sauce. Park tells us that all the sauces and spice blends come from Korea and even he doesn’t know what exactly is in them. Good luck trying to decode the Cheeezling Chicken. That’s with three Es. The tenders are dipped in a mystery powder that tastes two parts Doritos dust and one part Pixy Stix (or is it Fun Dip?). We are both horrified and delighted that we keep coming back for more of the salty-sweet morsels until the large platter is nearly empty. It seems important to note here that we are stone-cold sober during the incident. Despite the greeting of “BEER” in pink lights on arrival, Park tells us they are still a few weeks away from sorting out their cordials license. In the meantime, Mug Root Beer and Mountain Dew are pitch-perfect pairings. The restaurant does have three salads on the menu: Sweet Pumpkin ($9.95), chickpea ($10.95), and Cobb ($11.95). But ordering them feels a bit like going to Red Lobster and getting the chicken. 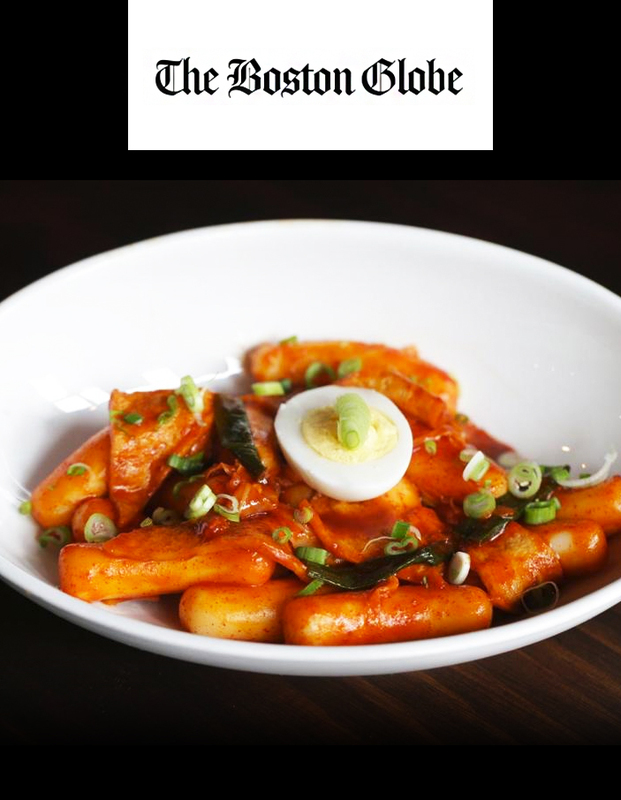 Skip the overpriced frozen French fries ($6.95), but don’t miss the dukbokki ($8.95), springy little rice cakes that look like gnocchi and are cloaked in a fiery red chile sauce with bits of cabbage. And seriously, at this point you might as well go for the version sprinkled with gooey cheese ($9.95). 182 Harvard Ave., Allston, 617-903-3359. All major credit cards accepted. Wheelchair accessible. Prices Chicken platters (large serves four people) $11.95-$24.95. Entrees $8.95-$13.95. Shareable sides $6.95-$9.95. Hours Daily 11 a.m.-11 p.m.